Ice Hockey - 05. April 2019. Melissa Samoskevich (Sandy Hook, Conn.), Hilary Knight (Sun Valley, Idaho), Alex Carpenter (North Reading, Mass. ), Brianna Decker (Dousman, Wis.) and Annie Pankowski (Laguna Hills, Calif.) strung together five unanswered goals in the third period to power the U.S. Women’s National Team past Finland, 6-2, in its opening game of the 2019 IIHF Women's World Championship. Kendall Coyne Schofield(Palos Heights, Ill.) also added a goal in the first period. "It took us a while to get into our groove tonight, but I was really pleased with how we battled back in the third period," said Bob Corkum(Salisbury, Mass. ), head coach of the 2019 U.S. Women's National Team. "Tonight was a great first test for us against a fantastic team and goaltender, and we'll look forward to carrying this momentum into our next game against Canada." Finland broke the ice 9:28 into the opening frame when Viivi Vainikka sent a backhand pass to Elisa Holopainen streaking toward the net. She fired a shot that beat U.S. goaltender Alex Rigsby (Delafield, Wis.) on the far post for the first goal of the night. With 2:12 remaining in the first, Coyne Schofield took advantage of a delayed penalty call, beating Noora Raty gloveside with a shot from the top of the slot to even the score at one apiece. Knight picked up an assist on the play. Finland struck back when Petra Nieminen scored on the power-play after Pankowski was called for a high sticking infraction with 8:42 remaining in the second period, giving the Finns a 2-1 lead. Despite multiple scoring opportunities, the U.S. entered the final period trailing the Finns by one. Just three minutes into the third, Samoskevich evened the score for Team USA. Coming off the bench, Samoskevich gained the zone and gathered a pass from Megan Keller (Farmington Hills, Mich.) on the blue line before ripping the equalizer past Raty. 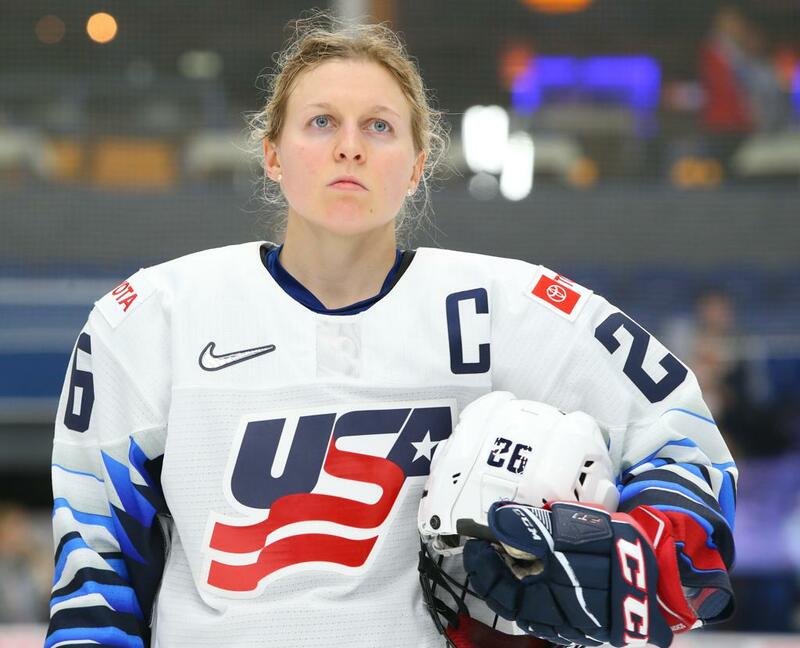 Less than two minutes later, Knight gave the U.S. its first lead of the game when she gathered a loose puck in front of the net and scored from the slot for the 3-2 go-ahead goal. Almost halfway through the period, Carpenter capitalized on a power-play opportunity, tipping home a shot sent on Raty by Cayla Barnes(Eastvale, Calif.) from the point to double the U.S. lead. Decker added another score with just under 10 minutes remaining when she carried the puck toward the net, deked and backhanded the puck over Raty’s right pad for the fourth U.S. goal of the period. Pankowski rounded out the U.S. scoring surge when she sent a shot top-corner from the right face-off circle, accounting for the 6-2 final score. Rigsby made 21 saves in net to seal the win for Team USA.